Apples and other fruits are widely recognized as part of a nutritious diet. But if you have diabetes, you may be concerned about fruit's impact on your blood glucose levels. Like all fruits, apples are rich in sugar, a form of carbohydrates which the body converts into glucose. Eating too much carbohydrates at once, or too much overall can lead to elevated blood glucose levels. The good news is that the American Diabetes Association (ADA) recommends the inclusion of fruit, including fiber-rich apples, in a diabetes meal plan as long as these foods are fit into your carbohydrate targets. When digested, the carbohydrates from apples are broken down into glucose, a simple form of sugar. As this glucose enters the blood, insulin is needed to help convert this sugar into energy. However, people with diabetes either don't make enough insulin, or their insulin doesn't work well, and as a result, dietary carbohydrates have the potential to lead to high blood glucose levels. To best manage blood glucose levels, it's helpful to eat moderate portions of carbohydrate-containing foods and to spread these foods throughout the day. Alternatively, if you take fast-acting insulin at meals, you can eat according to your appetite and preferences, since you can learn to match your insulin dose to your carbohydrate intake. A small, tennis ball-sized apple or one-half large apple contains approximately 15 grams of total carbohydrates -- about the same as 1 slice of bread. If you know your carbohydrate targets, you can decide which carbohydrate foods to eat at your meals and snacks. For example, if your lunch carbohydrate target is 45 grams, you can choose to eat one-half apple at 15 grams along with a whole sandwich at 30 grams, or you can choose to eat the whole apple at 30 grams with one-half sandwich at 15 grams. Either meal will have a similar blood glucose impact, since the carbohydrate grams are the same. The health benefits of apples make this fruit a healthy carbohydrate choice. Fruit is fairly low in calories and a good source of dietary fiber. According to a review article published in the July 2012 issue of "Advances in Nutrition," the fiber naturally found in fruits and vegetables is linked to a lower risk of a common complication of diabetes -- cardiovascular disease. In addition, fruit provides vitamins, minerals and phytochemicals, which are plant chemicals that convey most of food's disease protection. ADA's 2014 nutrition therapy recommendations, published in the January 2014 supplement of "Diabetes Care," encourages daily inclusion of carbohydrate foods such as whole grains, legumes, vegetables and fruits. ADA guidelines do not restrict fruit, other than to recommend that fruit be consumed within carbohydrate targets. The form of the apple also appears to matter. 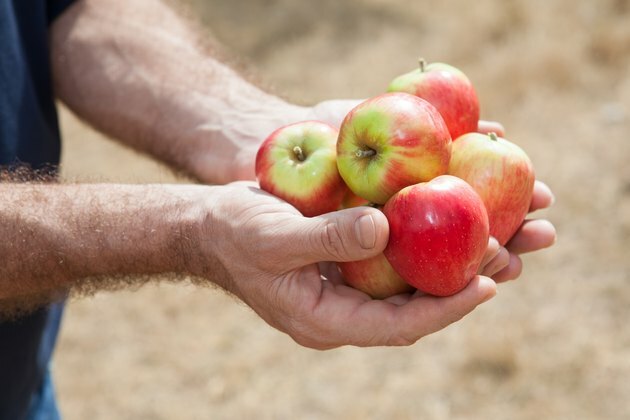 Whole apples, in part due to their unprocessed form and their fiber content, are more filling compared to processed apple products such as apple juice and applesauce. Whole, unprocessed food typically digests more slowly, leading to a more gradual rise in blood sugar. And despite the carbohydrate content of apples, this fruit may even offer protection from diabetes. A study published in the August 2013 issue of "British Journal of Medicine" linked consumption of whole fruits, including apples, to a decreased risk of type 2 diabetes. However, in this same study, fruit juice was linked to an increased risk of diabetes. Apples can be a healthy addition to a diabetes meal plan. However, as with most foods, portion sizes are an important consideration. Eating too much fruit, including apples, could worsen blood sugar levels. In addition, not everyone tolerates high fiber fruits, as apples have the potential to aggravate gas and bloating if you have slow digestion or irritable bowel syndrome. If you have food intolerances, or if you want to learn your carbohydrate targets and how to fit your favorite fruits into your meal plan, meet with a dietitian. If your blood sugars are not in control, or if you need guidance on how to manage your blood sugars, discuss your concerns with your doctor and diabetes care team.